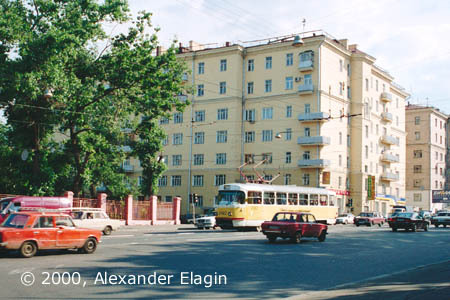 A tram line along Rusakovskaya Street continues the line from Komsomolskaya Square, and it was also constructed in 1875 with horse-drawn cars operation. 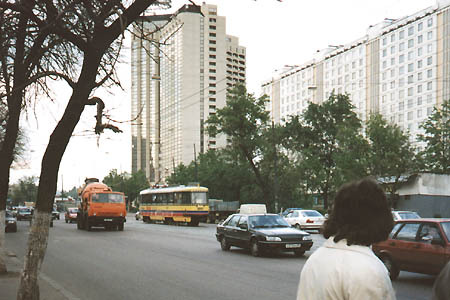 The line connects Komsomolskaya with Sokolniki district, the popular recreation zone. What makes it rather unique even in Moscow is its alignment in the centre of the road, and more to say - stops are not even equipped with safety islands. Of course, motorcars (three or four rows) are oblidged to stop and wait while commuters are boarding, however I would not be comforted to use the line regularly. This part of the street does not look as proud as the very beginning, the houses are rather simple - the style of 1940's. 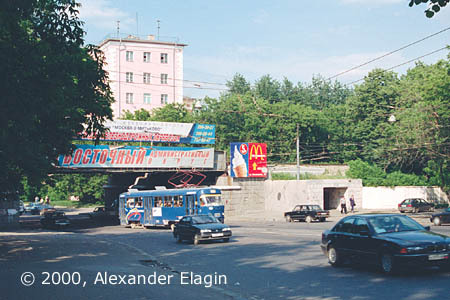 A railway bridge crosses the street, making this place very narrow. A pedestrian underpass seen in the right was constructed a decade ago to allow for pedestrians walk without special care under the bridge. But the road in fact needs to be widened. 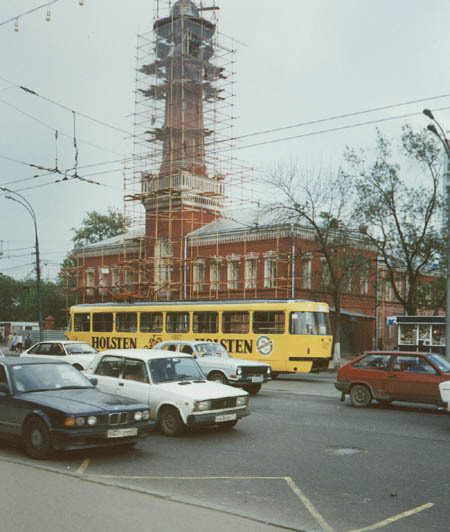 The tram moves along Rusakovskaya Street towards Sokolnicheskaya Zastava Square. A high tower in the distance is the Sokolniki Hotel. Bare trees to the left had died because of great amounts of salt in winter; later they were cut down, and everything was covered with asphalt. One of the most interesting objects in Sokolnicheskaya Zastava Square is this old watch tower. A century ago, this tower was the highest building in the neighbourhood, but today it is almost obsured by new blocks. The tower was renovated in 1997 and now looks the way it deserves.